The Police had a massive hit with it. And there’s something romantic about the idea of putting a message in a bottle and sending it off into the blue yonder. In the north-east of Scotland, one teenager, Emily Plant, has earned plenty of coverage in recent weeks after a bottle she placed in the water at Findochty in Moray, turned up all of 15 years later – in Russia. She subsequently had the artefact returned at a conference in Iceland and met Nicola Sturgeon over the weekend. In most cases, any such messages were lost forever, but others washed up on beaches and shores and aroused interest wherever they were discovered. 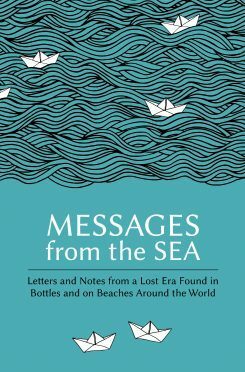 Now, an author has published a new book about some of the many bottles which not only contained poignant and memorable messages, but covered some of the biggest triumphs and tragedies in history. Paul Brown has highlighted 100 instances of messages conveyed via the sea, and many of his tales revolve around Aberdeenshire maritime lore and history. These accounts are both fascinating and heartbreaking at the same time. Just consider one of his examples. In May 1873, an 11ft shark was caught off the west coast of Scotland, and gutted in front of a large crowd. Inside were found pieces of cod, dogfish and seal, but also a man’s bonnet, and, most interestingly, a message in a bottle written “in a lady’s neat hand”. The glass item had been cast into the sea, partway between Britain and Australasia from the Aberdeen clipper Beautiful Star. The message was signed by Annette Gordon, and also contained a poem dedicated to the new-born baby. The Beautiful Star was located in New Zealand, and it was confirmed the captain’s wife had given birth to a baby boy. This is one of several references to Aberdeenshire vessels and sailors included in the new book Messages from the Sea. Dating from the late-19th and early-20th centuries, they tell of foundering ships, missing ocean liners and shipwrecked sailors, and contain moving farewells, romantic declarations and intriguing confessions. Indeed, included among the 100 messages in the book are a clue to the fate of the missing White Star liner Naronic, an update from Sir John Franklin’s lost Arctic expedition, and a message from the deck of the sinking Titanic. The book was compiled by Mr Brown, from Seaham, County Durham, in north-east England. He said: “I first stumbled upon these messages by accident, but quickly became fascinated by them. “Each little message tells a different story, and they’re full of drama, mystery and romance. It’s likely that only one in 100 or a 1000 ever reached their destination and offered any hint of solace. But, if anything, that simply makes them all the more evocative. SPONSORED: Six of the best days out!